I recently received word that I have work in Fairbanks, Alaska, helping with the documentation of Pioneer Park for the National Register of Historic Places. I am happy to be working again for Janet Matheson, AIA. She first hired me and Charles Backus for the City of Fairbanks Historic Building Survey back in 1978. Some of those buildings were at Alaskaland, which is now called Pioneer Park. That was the first historic resources survey I worked on, and it led to many interesting assignments in the following years. Perhaps my most notable assignment was being asked to photograph the Mission San Antonio de Valero (the Alamo) in 2016 for the Historic American Building Survey at the Library of Congress. It will be fun to come back to Pioneer Park, and see if I can improve on my efforts from 40 years ago. 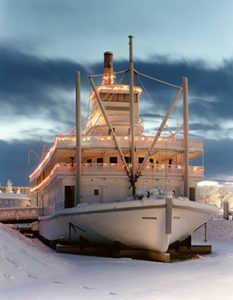 Some structures are already on the National Register, including the Riverboat Nenana. This project will be done with a full frame digital camera, using perspective adjusting lenses.